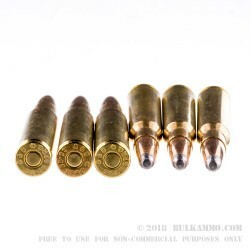 It’s funny, back in the huge surge on ammo sales around 2012, when all of the shelves were picked darn near clean it seemed there were one or two calibers which were always on the shelves: .30-06 was one of them. Personally, it seems a little crazy that so much is made of the lethality of the .223 as though it were some kind of unearthly weapon; a Death Star if you will. I am pretty sure that the venerable .30-06 has vanquished far more enemies in the 20th century than the 5.56 did between the two World Wars. Give me a .223 and 400 yards and I’ll maybe drop an enemy combatant, but give me a .30-06 in the same scenario and, well, I’d feel much more comfortable with the odds. It is also no great shock but the .30-06 is the most popular deer and medium-game hunting caliber in the world. So, with this knowledge in hand why is there no rush to clear the shelves of this popular round? Who knows, but why sit around asking why? 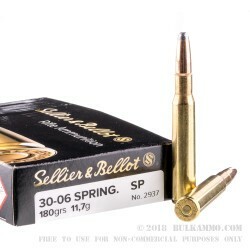 That is time that could be spent buy a case of 400 rounds of Sellier & Bellot 180 grain SP. This is a great all-purpose round, and plenty of it. It is enough for a lifetime of whitetail, a number of days at the range, or to pad your bug-out stash. Whatever you need it for, there should be plenty and at a very reasonable price. Don’t wait around and see if others come to their senses and clear the shelves of this great round. Q: were are they made? A: Hello Jonny! 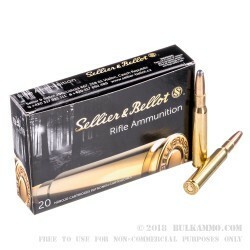 Sellier and Bellot ammunition is made in their factory located in the Czech Republic. 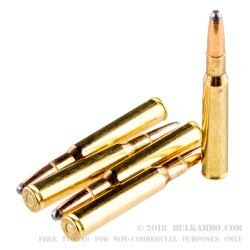 Q: I want to use these bullets for different types of shooting, what is the velocity? A: It would be best to store these in a cool, dry place. Gun cases can often retain moisture that will harm ammo. If stored properly, this ammo will be reliable for many years.